Every family has their stories—the ones that are retold so often they become a part of family lore. For Bill and Glima Beverley, it’s their engagement story, and Bill still loves to tell it nearly 70 years later. 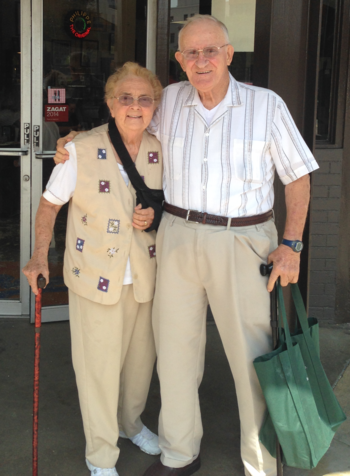 Bill and Glima’s love story started long before their Tennessee vacation. They first met in the seventh grade, and started dating their senior year of high school. After graduation, Bill attended Virginia Polytechnic Institute and State University, then eloped with Glima before they left their home state of Kentucky and moved out to California in 1950. They soon welcomed two sons. As the years passed and the couple grew older, Bill began to notice changes in his wife. Eventually, he says, “she lost interest in everything. Her hearing had gone bad and she didn’t care.” In 2012, he took Glima to the doctor, who diagnosed her with the early stages of dementia. Luckily, with hearing aids and medication, Bill says Glima was able to get back to “her old self” for several years. Sometimes Glima would think they were at the family cabin in Northern California, when they were actually at home in Orange County. Instead of trying to correct her, he learned to go along with her. Even so, Bill noticed Glima lost much of her will to do anything at all. “We went from her helping me a little to me doing all of it. It became a 24-hour a day job.” That’s when he reached out to his health insurance provider, SCAN Health Plan. Like many caregivers, 89-year-old Bill is battling health issues of his own. Twenty years ago, he was diagnosed with macular degeneration, a condition that has caused him to slowly lose his eyesight. He says that losing his vision has not only kept him and Glima from enjoying some of their favorite pastimes, but has even more so resulted in a loss of independence—as with driving, for example—which has been a hard pill to swallow. Thankfully, he has a lifetime of happy memories to draw upon. For their 50th wedding anniversary, the couple took a cruise to Alaska, the 50th and final stop on their all-state bucket list. It was there that Bill finally repaid Glima the $20 she’d loaned him for the wedding ring set the pair picked out together all those years ago.